Dr. Paul Alban has tried hard to forget. He’s managed to carve out a quiet and relatively anonymous existence with his girlfriend Ellen while working as a physician in Somalia. But when a Somali pirate is injured during the hijacking of a cargo ship and brought to his clinic for treatment in the coastal town of Bosasso, the demons of his past threaten to destroy the future he’s trying to protect. Paul is not only a physician for a humanitarian agency; he’s also a clandestine operative for the United States government. His most recent task was to provide a gang of Somali pirates with the shipping manifest of a Ukrainian cargo ship. According to the manifest, the ship was loaded with munitions. Strangely, it didn’t list the thirteen man portable nuclear weapons in container R-EX 030862. Even stranger, Langley denies having sent Paul the manifest in the first place. But when a group of terrorists, led by Kadar Hadad, the man Paul nearly killed a decade earlier, steal the weapons and kidnap his girlfriend, it becomes clear to Paul that he’s been set up. Now, considered a traitor in the United States, Paul must decide whether to go into hiding, or settle a decade old score and stop an unthinkable attack on U.S. soil. I enjoy reading a book that not only keeps me reading, but causes me to have to do some research on my own. I think that is the teacher in me that feels the need to know more about a subject. 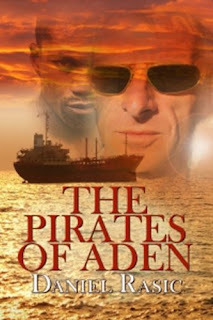 Until this book came along, I’d never heard the word Aden, and had no clue there was a “Gulf of Aden”. Personally I’ve not paid a lot of attention to the news accounts of current day pirates. After reading this book I’m sure I’ll look at piracy differently. Daniel Rasic has created characters and events so realistic, you feel you’ve stepped through the pages of his book. I for one love books like this because even though I love trying to figure it all out, (and I’m not good at doing that), I am always surprised by the twists and turns. Trust me, this book is full of twists and turns. At times I wondered as I read how Paul managed to survive being as mouthy as he was. This is an awesome book for anyone who loves spy thrillers. Check out his book trailer here. Thanks so much Sandra for your review!